You know those days when you just need a little something special in the morning? Well, I've found a new indulgence for the shower that simply cannot be paralleled. Every time I open my bottle of Jo Malone Lime Basil & Mandarin Shower Gel, I feel instantly revived and ready to take on the day. This scent is an interesting combination of zest and spice. Notes of lime and mandarin combine with peppery basil and white thyme, weaving together to create a luxuriously rich and fragrant aroma. It lingers upon the skin without feeling heavy or cloying. And the lather? It bubbles and froths like no other. 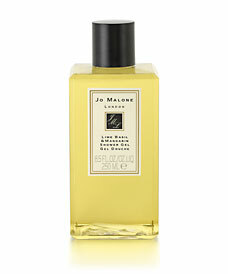 Jo Malone Lime Basil & Mandarin Shower Gel is $25 for 100ml and $50 for 250ml at jomalone.com.